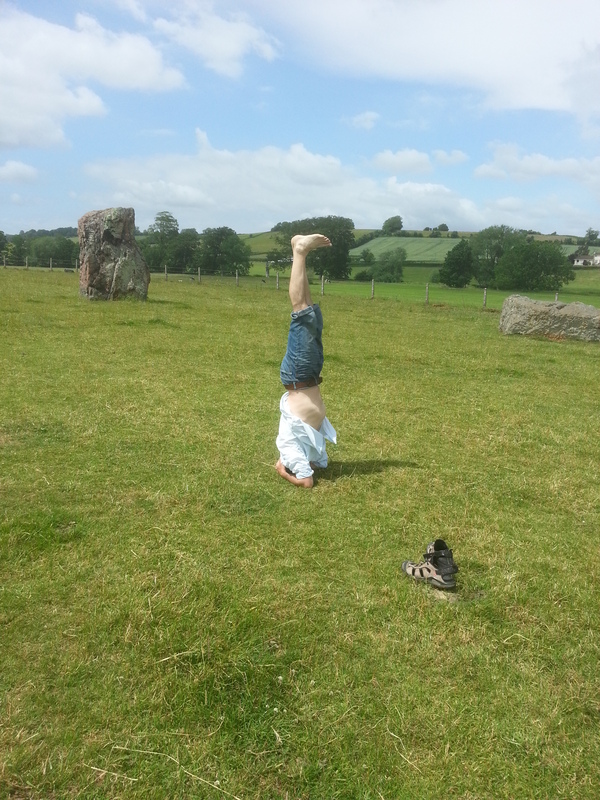 We attended Stanton Drew stone circles in Somerset, an ancient site. I did Sirsasana (the head stand) in the centre of the small circle. This was in keeping with World Yoga Day. Visiting the stones at the solstice is also auspicious. There is little information about how they got there, however on close inspection the rocks appear as if they had been subjected to great heat at some point. There are blackened striations visible throughout many of them and the geology doesn’t look familiar. You can see crystals in them and on one we found what might be a fossil. Who knows where they came from or how they got there. For ancient peoples to have moved them would have taken enormous effort – but the pyramids in Egypt are testimony to these things being possible. Perhaps an asteroid crashed into Earth and the stones at Stanton Drew are shards of it? Performing Sirsasana at the centre of a stone circle like this, means the crown chakra (of the practitioner) is placed on the surface of the Earth. Rooting energy in a place where significant, positive vibrations can be felt. The stones have a timeless presence, each one has a character. They endure and one is humbled by being there. Sirsasana forces the yogin to look at the World upside down. Viewing the English landscape at Midsummer like this can be challenging. A helicopter flew over, the sound of it’s rotor blades bounced off the earth’s surface; I heard it as never before. Sirsasana has many health benefits. To perform it well requires confidence, strength and poise. Maintaining the pose on an uneven surface, out of doors in strong winds calls for additional skill. However, Yoga is not about showing off or competition. Perhaps Ban Ki Moon is misguided when he refers to it as ‘a form of sport’.